Synopsis: At first Lucy Pevensie is sad when she is sent with her sister and brothers to the countryside to escape the dangers of wartime London. But when they arrive, something wonderful happens: a game of hide and seek turns into the adventure of a lifetime! In the magical land of Narnia, Lucy and her brothers and sister meet Aslan, the great lion, who calls them to fulfil their destiny - free Narnia from the evil white witch! Review: This is a short story extension to The Lion, The Witch And The Wardrobe. 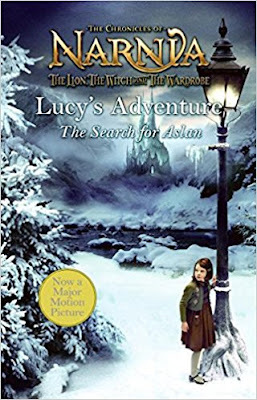 It gives a slight insight to into Lucy and her thoughts as she embarks on this amazing adventure to free Narnia from the white witch and save her faun friend. I have to be honest and say that I did not find this book particularly interesting and I did struggle to keep my attention on this book. However, it is worth the time to read as it is always interesting to get an idea of the thoughts and feelings of characters as they embark on a journey that is filled with fear and excitement. This book is a part of four short story extension books. The other three are based around Peter, Susan and Edmund. Each book follows a different child. These four books may not be ones that are read more than once if at all but they are still worth a place on shelves for fans of The Chronicles Of Narnia. Each short story adds something new and interesting to The Lion, The Witch And The Wardrobe so I recommend giving them a read. Even if they aren't the best of stories, they are only really short books that can be finished in the blink of an eye. I would have given this book a one star rating if it did not add to the story of The Lion, The Witch And The Wardrobe.